Handmade Repousse Brass Jewelry Box, "Mughal Paradise"
Glistening gem-like glass accents harmonize with the elaborate patterns that adorn this jewelry box. 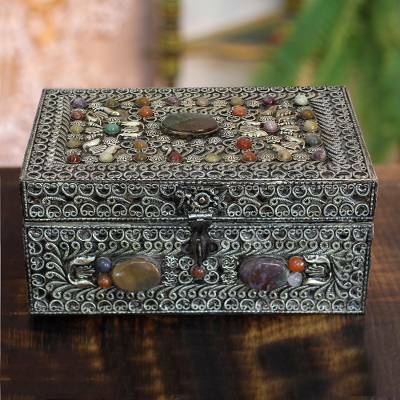 Designed by Khalid Ali, the jewelry box is masterfully crafted by hand with ornate nickel plated brass over wood. The velvet-lined interior has two practical compartments and a vanity mirror.